I don’t know if it just me, but I find myself REALLY annoyed when research study social media communities and don’t both to tell the communities about the research. I understand that researchers may not want to affect the phenomenon they are studying. But once the study is finished and findings are published, I think it is basic courtesy to at least inform the community about the publication. Some of the most vibrant and interesting social media communities are those whose common thread is illness or healthcare practice. I find myself beyond annoyed when I find that someone has quoted a blogger in their academic paper and then find out the blogger being quoted doesn’t know about it. This isn’t the old days, when informing an author of a quote was difficult. It doesn’t take much to click “comment” and leave a thank-you note, or send a quick email to the author, or a tweet to the twitter community. As an insider in some of the communities being studied, I find myself beyond annoyed. There is a risk that I might even be quoted in a research study and not know about it. Worse yet is the practice of taking away the attribution when quoting tweets. If you are going to quote or use my tweet as an example, I expect that you attribute it to me. Ugg. I’ve decided that anytime I come across a blog quote for a blogger that I follow, or a tweet for a blogging community that I have participated in, that I will inform the community of the research study and make available (if I can) the research paper to anyone in the community who might want to read it. As the “participant” in a study, it is my right to be informed about the results of the research that I am participating in. Even if consent is not required – the quotes are on publicly available websites or twitter – there is still courtesy. What do you think? 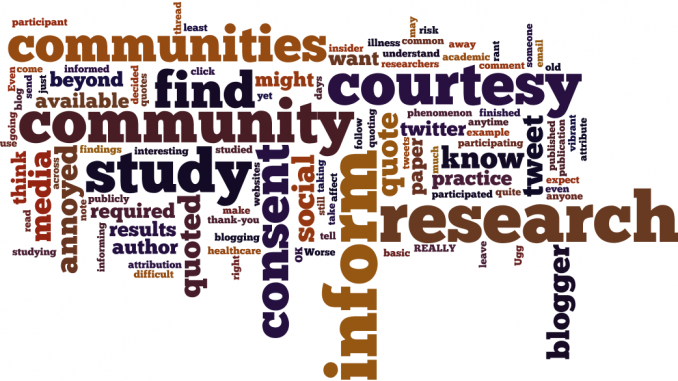 Should those who study social media communities be required to inform the community of the research results?